Prominent & Leading Manufacturer from Vasco Da Gama, we offer rinsing filling machine, filling machines & plants, automatic bottle filling machine, cup filling machine, rotary juice filling machine and automatic liquid filling machine. We have gained a remarkable position in the industry by offering a qualitative assortment of Automatic Rotary Rinsing Filling. In order to provide an excellent range to our clients, these rinsing fillings are manufactured by employing sophisticated technology by our competent professionals. Our entire range is provided in several sizes and specifications, as per the variegated requirements of our valuable clients. Apart from this, we provide these rinsing fillings in several modified options and at industrial leading prices. Blown bottles are conveyed through In feed air conveyor where high pressure air from blower is used to convey bottle to rinsing and filling station. A gravity filling method is applied to fill rinsed bottles. Liquid level controller fills bottles accurately and avoids overflow of bottles and thus wastage of product water. Latest technology avoids air from bottle to contaminate product water in the product water tank. No bottle No Rinse No fill mechanism is applied to avoid wastage of product water. The filled bottles are then transferred to capping head where prewashed caps seals the bottle . Caps from the vibratory hopper or cap elevator are U.V. sterilized before they are transferred to rotary capping Station.. A rotary automatic cap feeder is mounted on the machine and capping is done electro pneumatic Capper. Magnetic torque is applied on bottle screw capping. Constant screw capping power can be adjustable and therefore will not hurt the bottle at all. matter. Bottle travels on neck from in feed to out feed resulting scratch free movement of bottle. Human machine interface touch screen and PLC control system are adopted on the machine. The panel regulates operational speed with variable speed AC drive. · Vibratory hopper /Cap Elevator for cap orientation and feeding. ·All Contact parts in Stainless steel 316 quality and are endurable. ·No Bottle No Fill and No cap in built device. ·Inspection Screen for inspection of bottles. ·Latest Filling Valve Technology which avoids air from the bottle to contaminate product water in the filling tank. ·Online digital display Counter for finished bottle. ·Convenient for the operation and maintenance. ·Acrylic hood with safety door. ·All the components are sourced from reputed world known manufacturers. 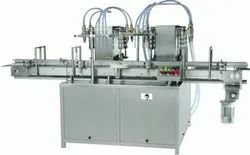 Our in-depth knowledge and industrial expertise enable us to offer a distinguished range of Automatic Bottle Filling Machine. Following industry defined guidelines, our competent professionals manufacture the filling machine by using contemporary machines, latest technology and prime grade basic material. In order to ensure quality, the filling machine is meticulously tested upon a series of parameters. In tune with clients' diverse requirements, we offer this filling machine in a wide range of specifications. 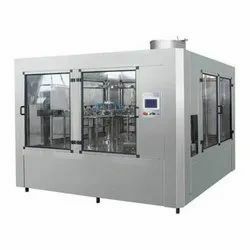 Being a well established organization, we bring forth an excellent assortment of Cup Filling Machine. Our provided filling machine is widely appreciated by our prestigious clients for their precise design and durability. The provided filling machine can also be availed in several sizes, designs and other related specifications. Our provided machine is manufactured by a team of our deft professionals utilizing quality approved raw material and advanced technology. TARGET INNOVATIONS Rotary Filling Machine is to high standard advance Touch Screen PLC base Rotary Pet Bottles Rinsing Filling Capping Machine. 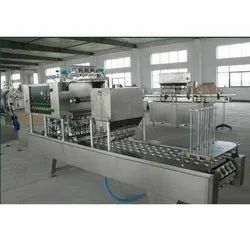 This machine mainly used for washing, filling and capping of Non-Aerated Drink such as Mineral water, Pure Water, Non-Gas _Wine Drink, Synthetic Flavored Juice and so on. The Machine design is shorten the time for the packaging of Pet Bottle, outside contamination and increased the sanitation condition throughout the machine and economical too. It adopts neck holding type conveying-bottle structure to make changing bottle model more convenient, faster and easier. The main machine adopts advanced PLC control technology with Gravity Filling Systems and Valves. Our wide assortment of Liquid Filling Machines are required to fill container, jar and bottle. The precise design of these equipments prevents wastage of filling material. Reckoned for its high automation degree, these equipments are completely controlled by PLC. The servo drives of these equipments are instrumental in proper positioning of container that need to be filled. Their dual speed controlling part is effective in prevention of liquid splashing. Food grade SUS material is used to fabricate its contact parts to avoid contamination. 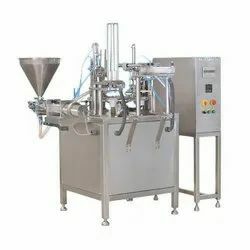 Precise design, rust proof finishing, convenient installation technique, minimal maintenance charge and durable body are some of the unique attributes of these Liquid Filling Machines. 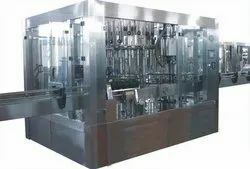 In tunes with advanced market development, we are offering a wide range of Piston Liquid Filling Machines from our extensive collection of filling machines. These filling machines are manufactured using quality assured raw material and latest technology by our competent professionals. In order to ensure quality, these filling machines are stringently tested on several parameters by our vendors' experts. In addition to this, remarkable sturdy structure increase the demand of our provided range in the market. 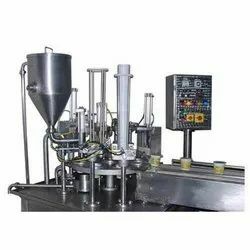 Having a definite quality management system, we are regarded as the noteworthy manufacturer, exporter and supplier of an extensive gamut of Automatic Cup Filling Machine. These filling machines are manufactured using quality proven raw material and advanced technology. In tune with different requirements of our copious clients, we modified the entire range in several sizes and shapes. Our provided machines have gained exceptional value amongst our clients for its defined features. We are an acclaimed name engaged in offering our precious clients a superior quality range of Semi Automatic Cup Filling Machine. Besides being manufactured from high-grade raw material and latest technology, the provided filling machine is inspected properly by our competent professionals. Due to its features like durability and sturdiness, the provided machine is exceptionally valued by our precious clients. The provided range is available with us in several sizes at affordable price. We provide Rotary Type Cup Filling Machine for many industries including food, dairy, and cosmetics. These machines are designed to fill, seal, and lid your products into stackable containers. They are fully automatic and can deliver up to 50 cups per minute per lane (dependent on container, product and seal type). 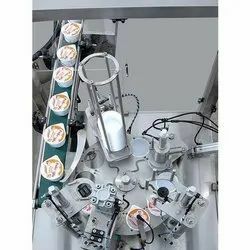 The entire line of cup machines comes equipped with advanced design features to guarantee products are packaged to your specifications every time. Viscous fluids, Pasty material with or without solid matters in hot or cold conditions like water, Pudding, ketchup, Cream Cheese, Jelly, Beverages, Lassi, Butter milk, Bean curd, Yogurt, Shrikhand, Honey, Jams (hot), Paints, Oils and other similar materials. Machine construction in Stainless Steel SS. Non -Filling and sealing for out of cup. Anodized Heating die with individual digital temperature control.